Ice Dam Prevention - MGT Insulation, Inc. When a building’s roof has snow cover, the snow touching the roof could start melting for a variety of reasons. As that snow begins to melt and becomes water, it runs down the roof and begins to cool. When the water is cool enough, it freezes. This is the beginning of an ice dam. More snow melts and begins to build on top of the frozen area creating various sizes of ice dams. 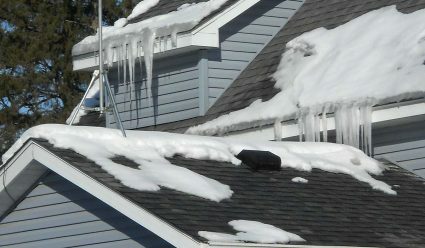 Ice dams are problematic because they trap melting water, which can seep under your shingles and through your roof, causing all kinds of damage. How Do I Know if My Home is in Danger of Ice Dams? If your house is more than 25 years old, it probably has attic bypasses, which are construction openings from carpenters, electricians, plumbers, and heating contractors that allow indoor air to escape to the attic – for example, a chimney. Houses and commercial buildings are under the law of positive pressure called “stack effect,” meaning that indoor air is going to press upwards toward the exterior and escape through any opening that is available. You might be able to see any openings from inside your home, but that doesn’t mean that they’re not there. At MGT Insulation, we have the tools to pinpoint these openings and the experience to seal them. At MGT Insulation, we ensure a cool roof and limited ice accumulation in three ways. We use Infrared thermal imaging and blower door testing to pinpoint where the leaks and weak areas are letting both heat and cool, air conditioned air outside. Our technicians securely seal these bypasses with caulk, spray foam, sheet metal, drywall, or rigid foam to create a firm, airtight, permanent seal. Learn more. At MGT Insulation, our comprehensive attic insulation process ensures that your attic will function efficiently to prevent ice dams and keep your home or business functioning safely and efficiently. Learn more. Proper ventilation helps keep your roof system cool by mixing outdoor air with attic air. Learn more. The safest way to remove an ice dam is to leave it to the professionals. Many accidents and even deaths have occurred while trying to remove ice dams. Professionals use steaming equipment to cut and melt the ice dam away. Some professionals use a form of sodium chloride, or salt, to melt the ice away. Because ice dam removal is expensive and ice dams can cause a lot of interior and exterior damage, ice dam prevention is the first and best way to protect your home – and at MGT Insulation, we can help you do just that. Our comprehensive ice dam prevention process is customized to your specific needs. Learn more here.